Plochmann Lane: Levon Helm & Rick Danko (The Band) meet w/ legendary "Diamond Teeth Mary". 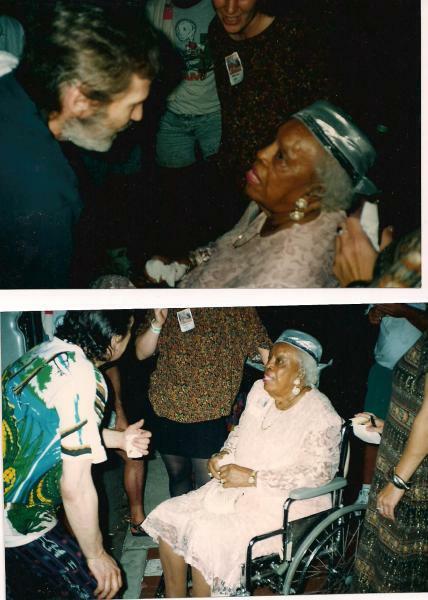 Levon Helm & Rick Danko (The Band) meet w/ legendary "Diamond Teeth Mary". Levon Helm & Rick Danko meeting w/ the legendary "Diamond Teeth Mary", the inspiration behind THE BAND lyrics "Miss Brer Foxhole who's got diamonds in her teeth" from the song "W.S. Walcott Medicine Show". "Our...favorite act was 'The Lady with the Million Dollar Smile,' F. S. Walcott's big featured singer, who'd come on in the third quarter of the show. She was an armful. She wore bright dresses and had all her teeth filled with diamonds! She sang on all those real get-down songs like 'Shake a Hand'." Thanks to Butch Dener for the pic.